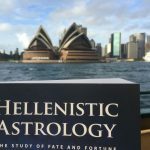 Hellenistic Astrology: The Study of Fate and Fortune is a survey of the history, philosophy, and techniques of Hellenistic astrology, which is a tradition of horoscopic astrology that was practiced in the Mediterranean region from approximately the first century BCE through the seventh century CE. 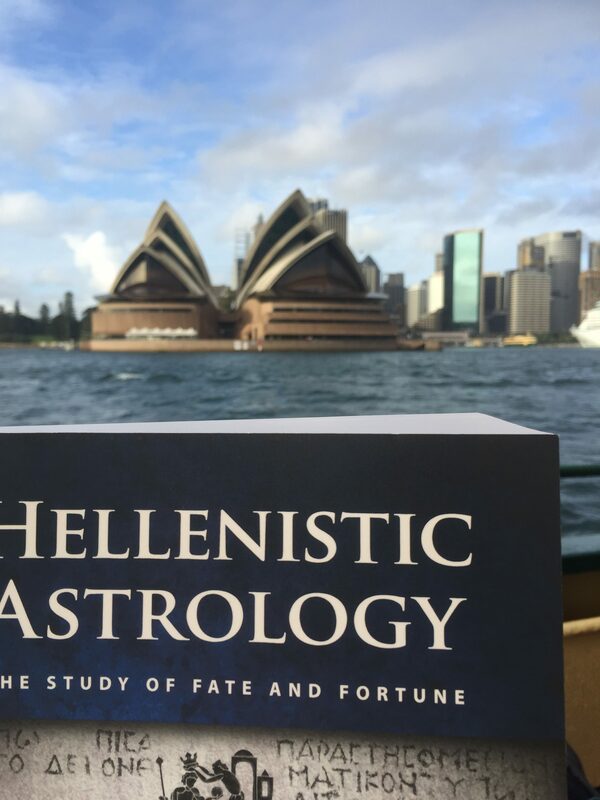 Although Hellenistic astrology is the source of many of the modern traditions of astrology that flourish around the world today, it is only recently that many of the surviving texts of this tradition have become available again for astrologers to study. During the process of recovering this tradition many techniques and concepts that were lost in the transmission of astrology over the past two thousand years have been rediscovered. 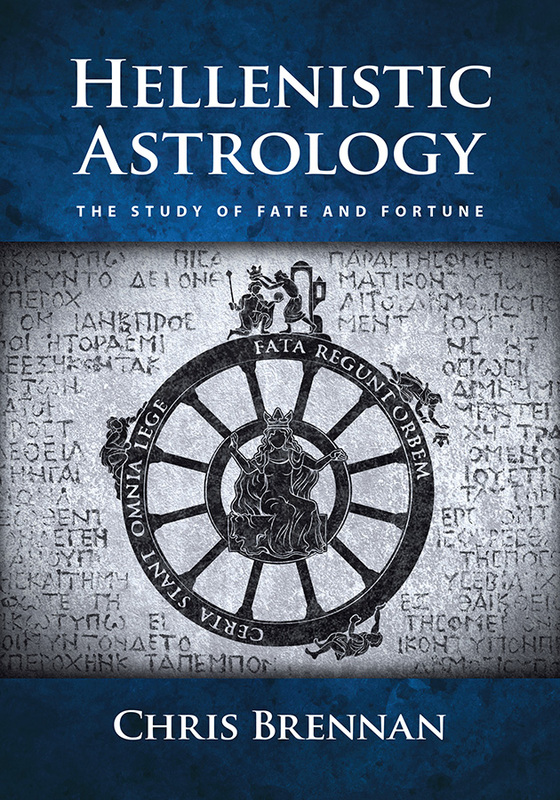 The product of over a decade of research, this book provides one of the first comprehensive treatments of ancient astrology in modern times. Learn the history and origins of western astrology. Explore the philosophical foundations of astrological practice. Become acquainted with the works of the most influential astrologers of antiquity. 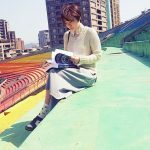 Understand the original conceptual motivations for many techniques that astrologers use today. Recover powerful timing techniques that were lost during the transmission of astrology. 50+ diagrams and tables, which provide rich visual illustrations of the concepts covered. 100+ example charts, which demonstrate how the techniques work in practice. A detailed bibliography of works related to the study of ancient astrology. A foreword by award-winning astrologer Demetra George. 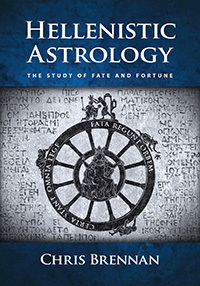 Hellenistic Astrology: The Study of Fate and Fortune is now part of the required reading for students of the Hellenistic astrology course, and as a result of this new students will receive a free copy of the book when they sign up for the course. The course provides a nice companion to the book, with over 90 hours of lectures and other material. If you would like to purchase the book and the course together at the same time then you can do so on the Hellenistic astrology course description page. The book has been reviewed in most major astrological journals and magazines since its release in February of 2017, and you can find some excerpts from these reviews here. 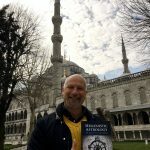 Chris has also done a number of interviews on different podcasts in order to talk about the book and what it is about, and you can find links to those discussions on the same page. If you are having problems finding the book in your area and would like to order it directly from Chris then please send an email to astrologue@gmail.com. Wholesale discounts are available for stores or distributors who would like to carry the book. The book should be available through the Ingram catalog. Send an email to Chris for more information. This is the only ebook format that it is available in at the present time. 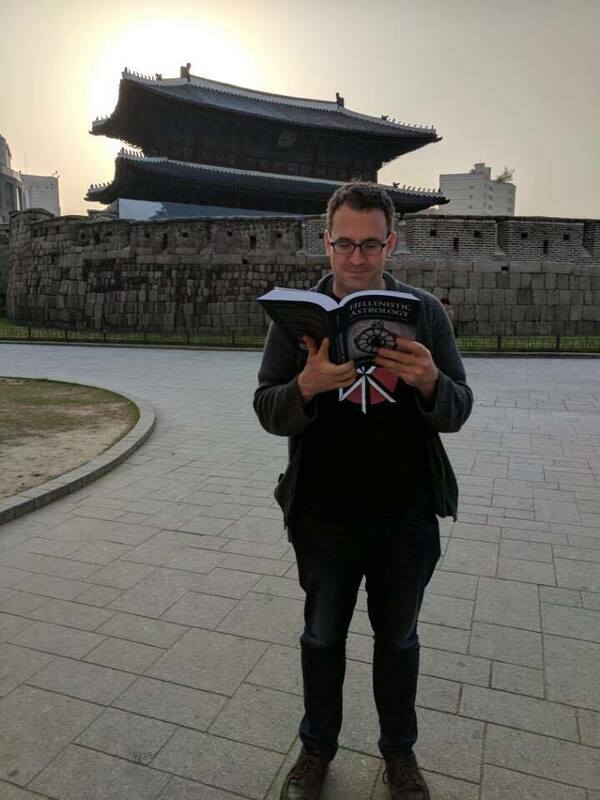 Readers of the book have been sending in pictures of it being read in different spots around the world since its release in February of 2017. Click here to see the full gallery of Hellenistic Astrology around the world. If you have a picture to submit please send it to Chris at: astrologue@gmail.com. Nicholas Cenidoza from Las Vegas, Nevada. 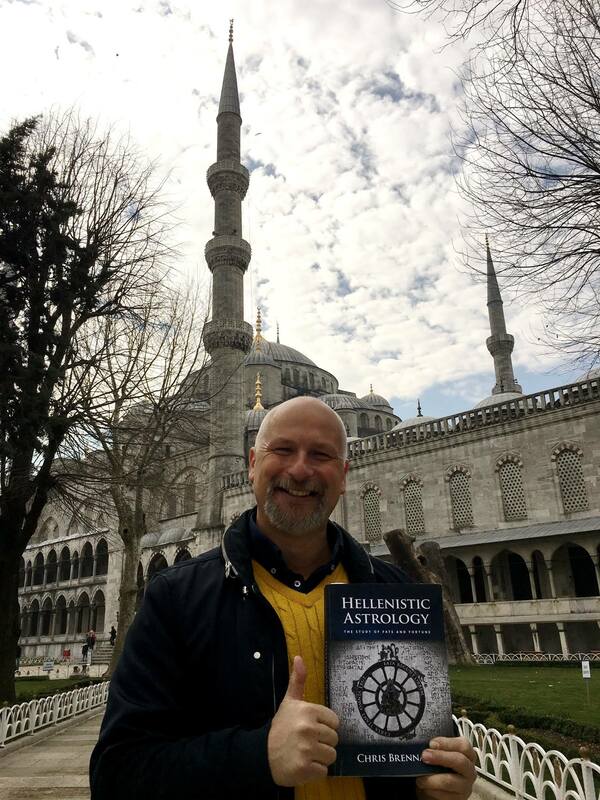 Öner Döşer in front of the Blue Mosque in Istanbul, Turkey, after a recent International Astrology Day event. 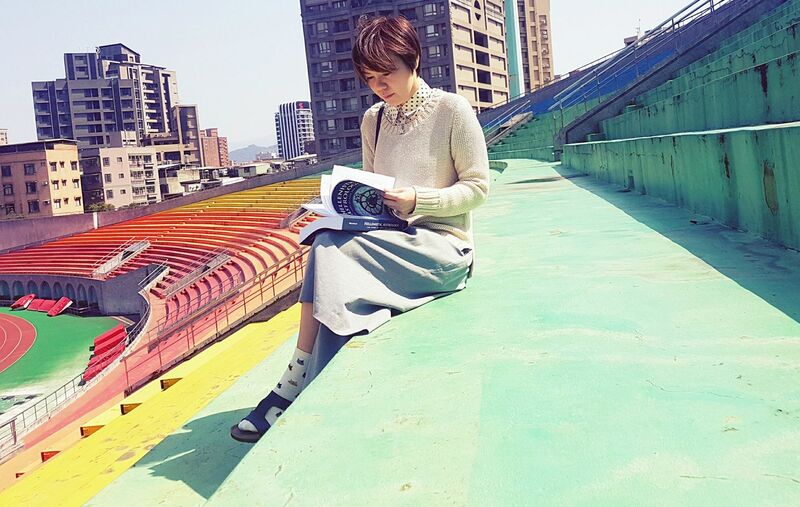 Chendi Chen in Taipei, Taiwan. 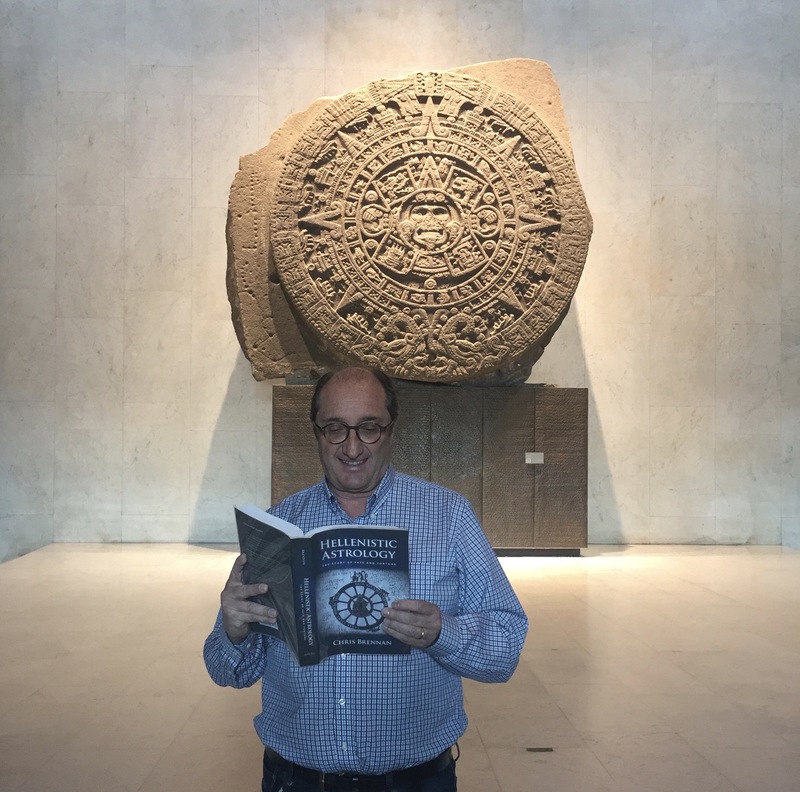 Victor Rosillo in Mexico City, Mexico. 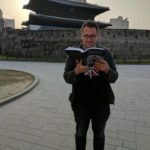 "Chris says that this book took him a decade to write, and the immense time and effort he has put into this book shows. 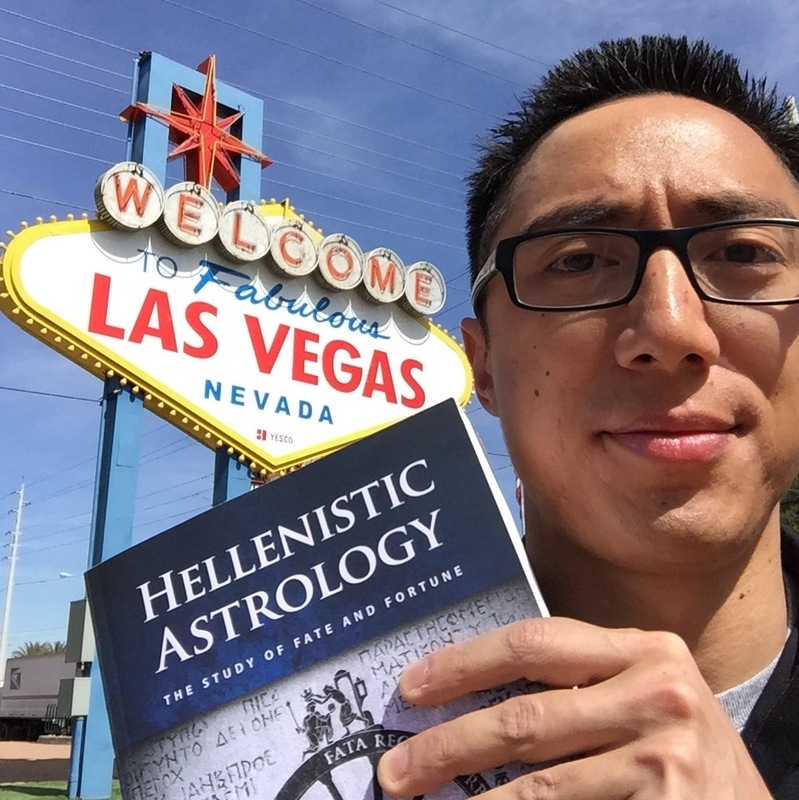 It's almost 600 pages long and accomplishes his goal of providing what is now the definitive overview of the philosophy, history and techniques of the astrology of the Greeks and Romans. ... In releasing his magnum opus, Chris has propelled himself to the forefront of contemporary Hellenistic astrologers. Hellenistic Astrology is now the primary secondary source for the study and teaching of Hellenistic astrology. It is my fond hope, as a member of the school of European medieval and Renaissance astrology, that the publication of Chris' book will accelerate the rise of Hellenistic astrology as a distinctive practice, such that it takes its rightful place as one of the major schools of astrology." "A definitive guide to Hellenistic astrology. The writing is clear, and the presentation is logical and understandable. Chris has done a great service to the field of astrology by gathering together and clearly explaining the original ideas and texts that form the foundation of the celestial craft. His approach is evidence-based. When there are controversies in the literature, he presents the various arguments and their supporting evidence and leaves it for the reader to decide. In addition to the theoretical and historical material, he offers a wealth of chart examples which illustrate the various hellenistic techniques. I have no doubt that this will become an essential text in the library of every serious astrologer. If I were permitted to buy just one book on astrology in 2017, it would be this one.."
"Excellent text. I was a professional astrologer for many years, and had already retired when I started hearing about Chris Brennan’s work. My interest in ancient astrological texts had begun with the brilliant opus of Project Hindsight in the 1990s, which I wholeheartedly supported; but it was Chris Brennan, over a decade later, who reawakened my passion for astrology. ... I highly recommend this book to serious students of astrology (and related historical disciplines) who wish to broaden their horizons, and at the same time deepen their understanding of this ancient and ageless field." "An outstanding work of astrological scholarship. Chris Brennan is to be congratulated on producing such an authoritative and comprehensive text on Hellenistic astrology. It is not a light read and with its 670 large format pages is weighty in all senses of the word. ... The writing is clear, straight forward and unpretentious. The author does his best to guide us through the confusing web of ideas and practices which were to become the basis for modern astrology. I believe this work will be the seminal work on this subject for some time to come." "If I provided only one word to describe this book, I would use: comprehensive. To add to that I must attach: organized, well written, clearly presented, and thorough. It is the type of book to which any author should be proud to attach his or her name. Congratulations, Mr. Brennan. Highly recommended." "Chris Brennan's book is a masterpiece in many respects. He understands how to explain difficult facts clearly and comprehensibly and builds the knowledge necessary for understanding step by step, which makes the book readable and recommendable for beginners. It is challenging and not a "by-the-bye", or astrological cookbook, but a meticulously created and with many cross-references created reference work which justify the somewhat high acquisition cost." "Chris Brennan's much-anticipated book is a superb and comprehensive introduction to the vast subject of the roots of Western astrology. This is surely the book (at least, the first) that he was born to write. His diligence, formidable intellectual curiosity, and thoughtful exploration have resulted in a work that fills and enormous gap between those dedicated aficionados who are doing the translations from the earliest sources of the texts (in Greek, Latin, and Arabic) and practicing astrologers with a keen interest in applying techniques that have been unearthed thus far from our history."